The Golding Jobber No. 18 was one of two presses in the Art Series and is the second largest Golding ever made. It has the same 12 x 18 chase size as the No. 8, but, the press is built much heavier. This example was manufactured near the end of the production run, and has all the bells and whistles available at the time. It has a full length ink fountain, adjustable rails, a duplex ink distributor below the bed, and a counter. 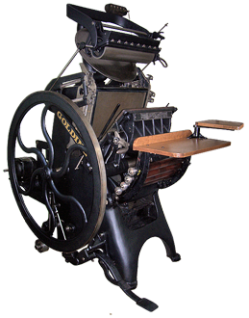 Another unusual feature of the press is that the bed is adjusted for impression rather than the platen, which is fixed. The press stands over six feet tall and weighs approximately 2600 lbs.